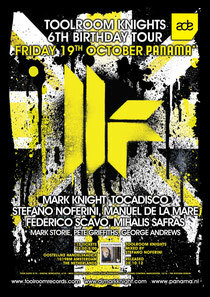 Toolroom Knights is hitting ADE, this Friday 19th October. Gracing the decks at Amsterdam's Panama Nightclub will be Mark Knight, Tocadisco, Stefano Noferini, Manuel De La Mare, Federico Scavo, Mihalis Safras and Toolroom Records' Mark Storie, Pete Griffiths and George Andrews. Bolstering Toolroom's connection with Amsterdam's annual Dance Event, Toolroom TV caught up with Dutch superstar Hardwell to talk about the pivotal role the city plays, ahead of Toolroom's third annual Amsterdam compilation - 'Toolroom Records Amsterdam 2012'. Set to a backing track of selected cuts from the album, Hardwell takes a tour of his favorite Holland hangouts; from the Blue restaurant atop the Kalvertoren shopping centre, to the Patta sneaker shop and onto Club Home, where the first Revealed Recordings party took shape. Demonstrating why ADE is such an important event in the dance community's calendar, Toolroom TV uncovers how the city shaped Hardwell's foray into electronic music, and hints at potential future Toolroom projects too.